Platform author, Warwick Lightfoot is a professional economist with specialist interests in monetary policy, public expenditure, taxation and labour markets. Formerly the economics editor of The European, he was for many years a frequent contributor to the Wall Street Journal and has written for the Financial Times, The Times, the Sunday Times, the Daily Telegraph, the Sunday Telegraph, and the Guardian. His articles on economics and public policy have also been published in specialist journals that range from Financial World, International Economy, and the Investors Chronicle to the Times Literary Supplement and the Journal of Insolvency Practitioners. Warwick worked in UK government as Special Adviser to the Chancellor of the Exchequer from 1989-92, initially appointed by Nigel Lawson and later reappointed by John Major and Norman Lamont. He was also Special Adviser to the Secretary of State for Employment, the Rt Hon Norman Fowler MP. 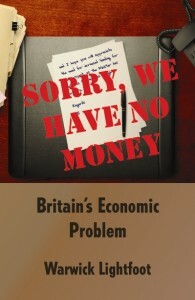 His new book, Sorry, We Have No Money is published by Searching Finance. Two distinguishing features of economic history over the last century have been dramatic experiments with non-market systems for allocating resources in the socialist and command economies and a dramatic expansion of collectivism and public sector activity in economies that would normally be considered as market economies. The experiments with socialist planning and command economies are largely perceived to have been a failure, but the development of a much larger state sector in market based economies in the middle of the 20th century appears to have yielded genuine social benefits. What is more not far from hindering economic performance it may have enhanced it. There are, however, diminishing returns to public spending and collective provision. There is also a real cost to public spending. What is more that cost is greater than the simple cash cost, because of the economic distortion created by taxation and allocating resources outside of the price mechanism. These deadweight costs mean that there comes a point where the costs of public expenditure begin to exceed its benefits and economic performance in the medium term starts to be hindered. It is not clear where that tipping point is, but it appears that a ratio of public expenditure between 25 to 33 per cent of GDP yields genuine benefits for little or no harm. After public spending reaches one third of national income, it seems that most of the things that collective action can accomplish are under taken. When spending rises beyond that point its costs and distortions begin to inhibit economic performance. The UK, which was in the vanguard of constructing a comprehensive welfare state, reached that position in the 1960s. The full extent of the structural problem created by excessive public spending is only properly exposed in a crisis like the one we have today and the inflation crisis we had in the 1970s. The parallels are compelling: a severe economic shock; public spending at close to half national output and structural a government borrowing requirement running at an unsustainable level. Both episodes resulted in emergency action to tackle the deficit. In the 1970s Jim Callaghan’s Labour Government was force to do so by the IMF. Today the sovereign debt crisis in Europe provoked by Greece persuaded the Coalition Government to take action in the Emergency Budget and the Comprehensive Spending Review. The Emergency Budget is necessary to stabilise the government’s borrowing problem, but putting up taxes and cutting public spending so that after five years the budget is roughly balanced with public spending still taking around 40 per cent of national income will not sort out the long-term structural challenge of public spending. Public spending should be reduced further as a share of national income and stabilised at an average ratio of 35 per cent over the economic cycle. Spending above that level starts to raise costs and makes it progressively harder for businesses that face international competition to compete. Manufacturing, in particular, finds it very difficult, unless exhibits very high levels of value added. A public sector that is too large will be a drag on economic performance; however, prudently it is financed. An interesting feature of UK economic performance over the last ten years has been the disappointing performance of the public sector The ONS shows that in years when public spending raised its productivity actually fell. Some people such as the Audit Commission have argued that this is because there were improvements in quality that are difficult for the statisticians to quantify. The difficulty is that such improvements are not easily reconciled with the litany of National Audit Office and Public Account Committee reports that catalogue failures in: the new Hospital consultants contract where pay rose by 27 per cent, but hours worked fell and new services promised failed to come through; the GP out of hours service; the primary school numeracy initiative; the adult education. Looking across Whitehall at resource management the Public Accounts Committee concluded that only 20 per cent of policy decisions ire was based on a thorough assessment of their financial implication. Light foot comments that: It appears that more than thirty years of public service reform have had little impact on the efficiency of Britain’s public sector. An agenda of managerial reform that has embraced cash limits, purchaser provider splits, and the creation of executive agencies, the citizen’s charter, contracting out, quasi markets and accruals budgeting and much else has failed to deliver an obvious improvement in public sector productivity. Most of the increased spending since 1997 has been absorbed in public sector pay and cost inflation. The evidence would suggest that a managerial agenda of public sector reform is unlikely to overcome the fundamental efficiency challenges that allocating resources outside the framework of the price mechanism and a hard budget constraint normally implies. Public sector managements under both Conservative and Labour governments have been reluctant and hesitant about challenging trade union and other vested interests. The result is that pay is over 12 per cent higher in the public sector than in the private sector and that public sector pay premium has risen over the last ten years. National pay bargaining means that the regional pay premium s are even greater. The argument that public sector pay will be higher because of the composition of the workforce means that it on average it employs higher skilled professionals such as teachers and doctors is not persuasive. The highest public sector pay premium is at the lower end of the earnings distribution. Public sector pensions are and will remain much more generous than private sector occupational pension arrangements. Management of employee performance and attendance in the public sector remains a challenge for employers. Parts of the UK are not just de-industrialised, but de- marketised. In many communities the combination of high public sector employment, national pay scales and the poverty traps created by the tax and benefits system has been toxic. In the late 1970s the replacement ratio of benefits to pay was about 60 per cent the IFS estimates that it has fallen to around 56 per cent. Individuals, communities and whole regions have been detached from the market. Many parts of the UK are detached from market economy .The position is analogous the regions of East Germany where high public spending and welfare payments emasculate private enterprise twenty years after the end of the socialist command economy. To reduce the ratio of public spending to the level where it is not imposing a permanent structural drag on economic performance would require policy makers to identify a further 4 to 5 percentage points reduction in public spending in relation to GDP. There are no obvious consumption and production subsidies or loss making nationalised industries to take out in the way that there were in the 1970s. Further realistic reductions of the spending ratio beyond those identified by the Coalition Emergency Budget will require public sector employment, pay and pensions to be reduced. It should be possible to obtain a reduction in spending equivalent to over 2 percentage points. It should also be possible to take out a further 2 percentage points of GDP from social security transfer payment made to households of working age. For example, in 1997 all benefits for children up-rated for 2010 prices amounted to £14.5 billion, the today they cost £35 billion. 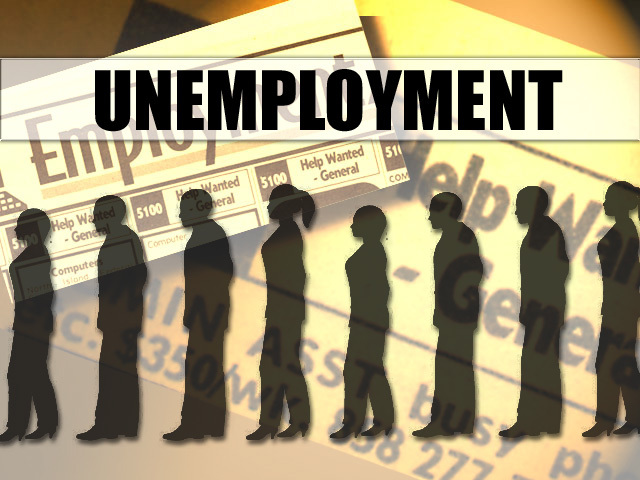 If public sector pay and social security transfer payments to households of working age were to take account of local labour market conditions such reform would make a significant contribution to re-attaching communities in the UK regions to the labour market. The underlying message of Sorry, We Have No Money is optimistic .The UK has a serious supply performance problem that it is rooted in public expenditure. That challenge will be aggravated in future years when an aging community has to be supported in the context of much tougher competition from countries such as China and India that will step up their competition across the value added continuum. Yet a manageable reduction in the public spending ratio should ensure that what by historic standards is a comprehensive and generous welfare state should be sustainable, provided there is greater realism about containing its cost. Moreover, although reducing the ratio of public spending is principally about mitigating long-term structural impediments on the performance of the economy, there may be some pleasant ‘crowding in ‘ surprises. Sorry, We Have No Money – Britain’s Economic Problem is published by Searching Finance.